You never have to create a project in advance in Noko! Unless you want to. There's three main ways to create projects in Noko, creating projects on the fly while you log time, creating projects in advance (convenient when you need to add a whole bunch of projects at the same time) and adding one from the Timer. 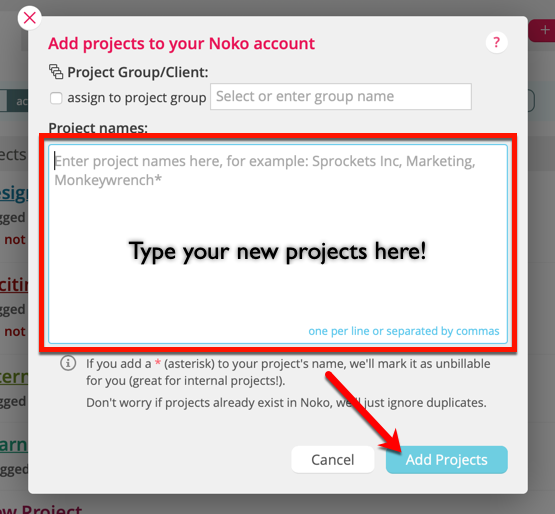 Enter one or more projects, separated by commas, into the text field to create new projects in your Noko account. You can add an asterisk (*) to create an unbillable project and you can choose a group/client to group projects together. When you're finished, click the Add Projects button. Even if you haven't created a new project in your Quick Entry Box yet, you can create it in your Noko Timer. Just click the '+ new project' button in the upper right hand corner of your Timer, type your new project name and click the pink check mark button. You can also use the keyboard shortcut "shift+N" to create a new project. Your brand new project will immediately appear ready to go in your Timer! In addition to manually creating projects, you can also have Noko automatically create projects from entries you import and directly from Basecamp.